The PC Gamer Weekender is taking over the London Olympia with a host of new and upcoming PC gaming releases. 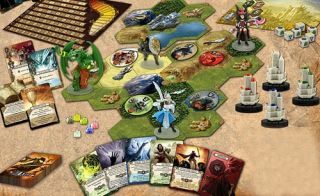 If you fancy taking a break from the screens Esdevium Games and Games Quest are bringing a brilliant selection of tabletop games to the show. The likes of the absolutely superb Codenames and the new Catan/Game of Thrones crossover edition will be playable. You’ll be able to get a good look at many different titles, including (but not limited to): A Game of Thrones Catan: Brotherhood of the Watch, Codenames, Dobble, Jungle Speed, Pandemic, Story Cubes, Splendor and Unlock. And you can, as you’d expect, find more information on the official websites of both Esdevium Games and Games Quest. The tabletop gaming section will be joined by many more speakers, games and booths, all at the PC Gamer Weekender, which is being held February 17-18 at the Olympia, London, in the UK. For more details see the site, and follow us on Twitter for up-to-the-minute news. Tickets are available now from £12.99. Use the code chr1stm4s to snip 20 percent off the price before January 5.